Yes, there was sadness in her recounting of the tragedy. But she, at that moment, was granted the opportunity which she so aptly took: exuding HOPE. Jerry S. Jones-Florman was born the second of 4 children in Des Moines, Iowa. She was privileged to have a mother who excelled at art. Painting was a family hobby. Jerry’s two sisters and brother also painted, though she is the one who continues. Her beautiful pieces adorn the home that she and her husband, Kurt, now rent in Yarnell. The plans are being made and adjusted for the rebuilding of the couples’ fire-destroyed home. Jerry attended college in Iowa in 1969, seeking a career in Early Childhood Education. “A regret I have in life is not finishing my degree,” she explains. However, she continued by pointing out that all the decisions, triumphs and trials of life make us who we are, and often result in uncanny strength. Her passion for children would lead to opportunities later in her life. “I remember ending up in a corn field for the night. The wind was whipping the corn around this way and that – I just KNEW someone was walking through the corn to come get me!” Yet, it always worked out for Jerry, and morning always came, dispelling the fears of darkness. 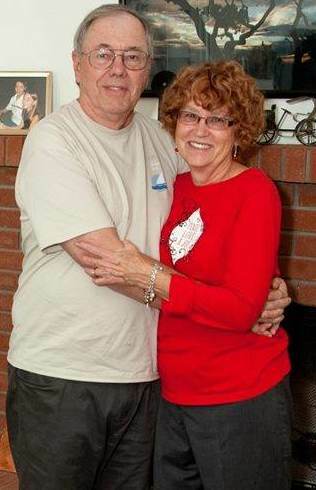 Growing up, Jerry traveled to Arizona every year with her family. It was a favorite state to visit. In fact, her parents bought a home in Cave Creek. At that time, Jerry was in Philadelphia, PA, and longed to be closer to her parents. And that’s how this lovely lady came to reside in Arizona. A good move indeed, especially since she met the love of her life, Kurt Florman. Jerry became Mrs. Florman in 1977, and there have been few regrets. The couple has an obvious respect and undying love for each other. Jerry had the privilege of marrying into an instant family as well. She has 2 step children and 4 grandchildren, who reside in the Valley. One giveaway of a solid marriage? Kurt and Jerry opened a Pre-School/Daycare called “Desert Blossoms” in their home, in Cave Creek, AZ; they worked together to realize her dreams for Early Childhood Education. Eventually, the Florman’s were able to build a second home, and the Preschool became New Friends Montessori and moved to a separate building on their property. Many children received a great start through these two preschools. The whole experience was wonderfully rewarding for Jerry. Naturally, we often wonder how anyone ends up in Yarnell, Arizona – small town, little known, hidden in the most awesome part of the Weaver Mountains….how does someone who lived in Des Moines, Iowa, the Valley, Cave Creek (and all over the country, including corn fields!) find Yarnell? Interestingly enough, Jerry’s sister invited her to come up for a Yarnell Daze Parade in 2002. It happened to be the annual “Yarnell Daze”. She fell in love with this community from the start, prompting her and Kurt to make Yarnell their home in 2003. Jerry poetically describes her take on this community: “The texture of life here is so rich.” Well-spoken, indeed. She quickly integrated into the Community Spirit of Yarnell, becoming active in many areas of interest. The Mountain Top Festival that first brought her to Yarnell is her “baby” this year. May 10th, 2014 will be a celebration of Community Spirit, the likes of which have never been seen. The post-fire recovery has unified the community. Jerry is looking forward to a fantastic “Yarnell Daze”. She has been planning, promoting and hosting meetings for the event for several months now. In addition to the busy-ness of Yarnell Daze, she is the writer responsible for The Wickenburg Sun’s weekly column entitled “Up Yarnell Way”. Jerry is quite a talented writer; her passion for Yarnell and all of its activities are evident when you read her articles. 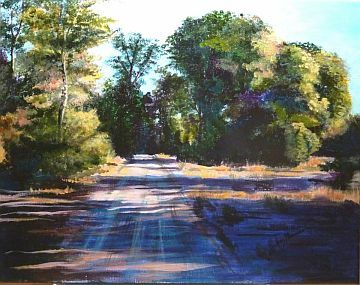 Jerry’s paintings are impressively creative; they are “Realism” paintings, touting immense detail and impeccable use of color. 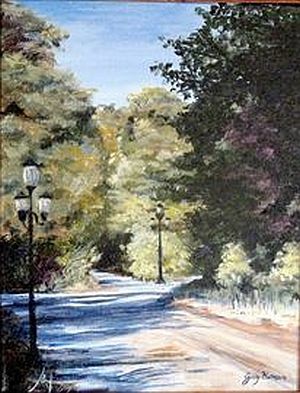 One of her paintings reminds me so much of my childhood hometown park, with the old light posts. The local scenes she chooses are peaceful and serene – soothing to view, much like the soothing effect of her speaking voice. 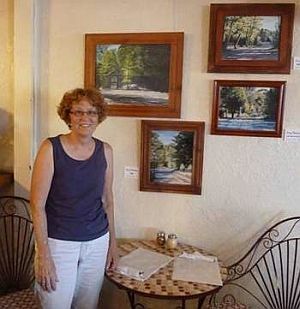 Her paintings are on display at the T- Bird Café in Peeples Valley. Jerry is also a weekly attendee of the local artist’s group that meets to paint every Thursday morning. 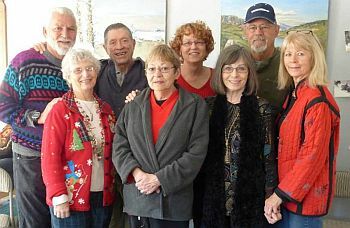 Chuck Tidey, Bill Chaplin, Barbara Schlegal, Bob Brandon, Cynthia Reece, Anita Kristensen and Sandy Oldman are her Thursday morning companions. This group has become close-knit, and the time they spend together is a highlight in their week. Jerry has many other hobbies as well. She loves to entertain guests at her home. She gave me a preview of the new house plans, pointing out that there will be plenty of room for parties at the Florman house! Jerry also loves to sing. Sometimes she sings with Bill Chaplin and Vanessa Purdy. Her favorite genre of music is “Posi Music”, AKA “Positive Music”. Uplifting lyrics that reflect her hopeful attitude are her songs of choice. One of her very favorite songs is a composition is by Jana Stenfield: “Say Hello to Your Destiny”. “That’s where we are right here in Yarnell: this is our New Destiny. In light of all that has happened since last June, this is WHERE we ARE,” she says, with that comforting look in her eyes. What a pleasure I had to meet with you, Jerry. I know I can speak for all who know you in Yarnell: we sincerely thank you for the encouragement you give us, the light you shine in your smile, the talents you share with us and the work you do to further unite Yarnell. Thanks Denise – wonderful article about Jerry. She is truly a remarkable woman, great friend, and an asset to Yarnell with her positive energy and willingness to take on projects like Yarnell Daze. Wonderful article about Jerry Jones Florman. She is truly a delightful, energetic woman and I am proud to call her a friend.